We ordered breakfast and some morning champagne to celebrate, the two rings designed to manifest the bond between Yarkın & Duygu on June 23rd, 2017. It had been 2 months since we decided to meet in a coffee shop and Yarkın texted me “We are the couple who look too young to be married”. I started doing “storytelling sessions” with people that I want to design custom objects for. I listen to them to get some content to design with, we get to know each other. This additional part of the process results in unique pieces, they share their unique story, I combine it with Neferka’s aesthetics and craft them into jewelry. I reveled in listening their story, starting as a seed at an early age and kept flowing like a river, almost as natural as something following an ancient rule that is constantly around us without us noticing. Hearing the same story from both showed me the difference in their self-expressions. Yarkın was very lingual, rational, chronological, making sure not to miss any of the important points, sincerely making sure everything is on the table. Duygu, who is a sensitive, emotional woman, choosing relevant words with intuition rather than dealing with constructing a sentence, almost sculpting emotions in the air with words. If I could do the same with forms, it would have been enough, in fact that was exactly what I tried to do, sculpting their relationship in to form and gold. I took some notes and also received some extra documents from Yarkın that enhanced my ideas. The dual dynamic between the couple was a complex relationship. The two somehow completed, fed, and grew each other. I was thinking about how they started tiny, and were on their way, getting colossal together, expanding in life, their fields. They were like derivatives of the same curve, ornamented with different language. I realized I was already thinking in the language of forms so I sent them some sketches. For structure, I used the same fractal curve spirals out from itself to another curve, growing and shrinking, trying to re-manifest what I felt listening to their story in Neferka aesthetics, minimal, meaningful. 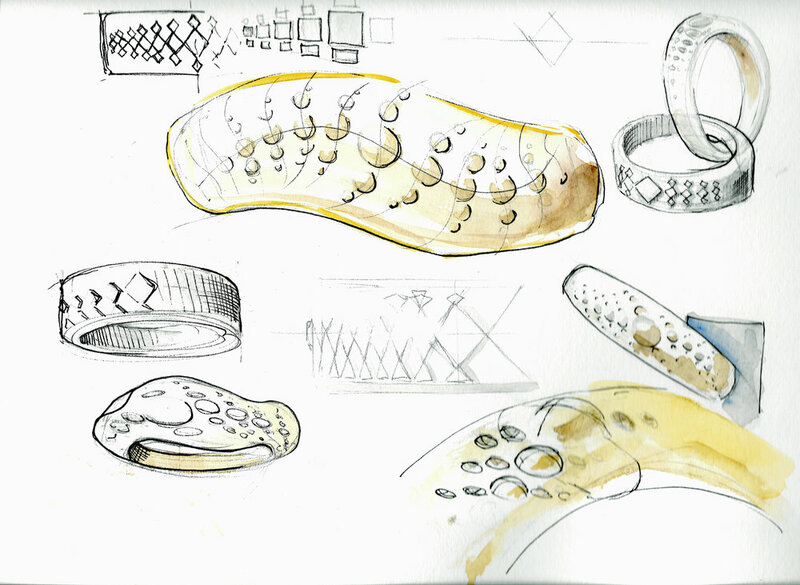 I provided them sketches, renderings, animations and finally prototypes. 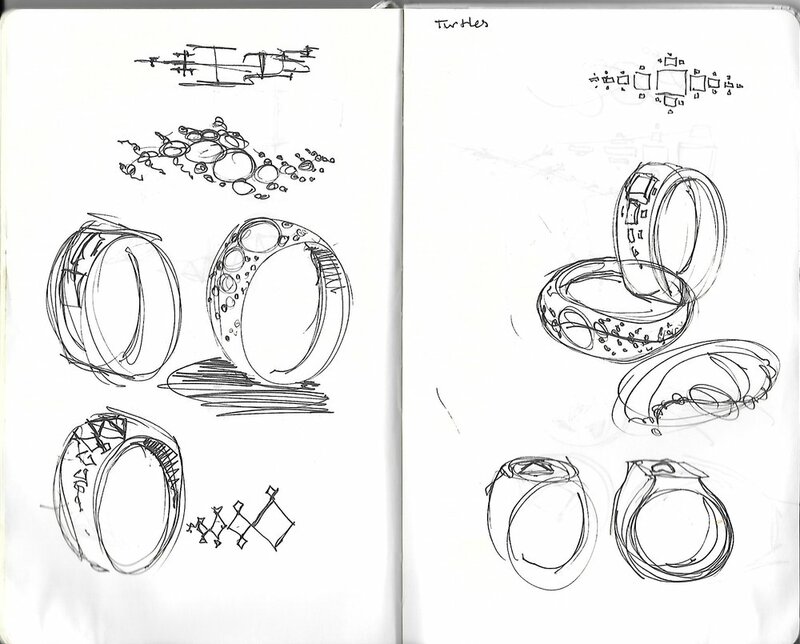 After their approval I worked on the final rings. 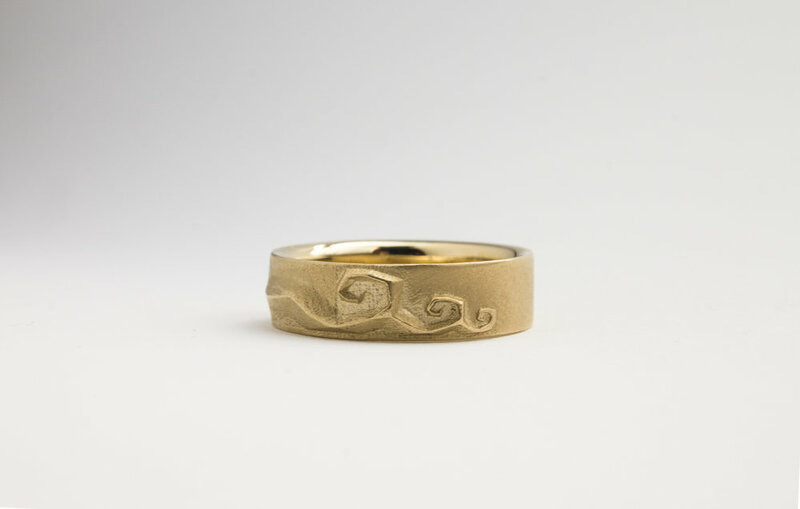 Yarkın’s matte finish ring was a thicker band that was more geometric, with stiff triangular forms giving it height and Duygu’s ring had stretched ellipsoid depths, following an asymmetrical organic shape, formed by the outlines of the spiral. For me this was a great opportunity to know a couple, learn their story and gave me inspiration to move forward with more custom design work. Say hi to me, send an e-mail(to eli@neferka.design), lets arrange a storytelling session with you too!